Returning to Theatre Royal Plymouth for the fourth time, internationally-acclaimed artist Hofesh Shechter has single-handedly created a new genre: part dance, part gig, part theatre and wholly original. Performed by a ten-strong tribe of world-class dancers, Grand Finale combines a cacophonic, pulsating score and a richly theatrical set and costume design with the anarchic energy of Shechter’s choreography. The company have just moved into TR2, to begin a 5 week residency ahead of the preview performances at Theatre Royal Plymouth on 1 and 2 June. The company then travel to Paris for the world premiere. We spoke to Associate Artistic Director Bruno Guillore, dancers Merel Lammers, Kim Kohlmann, Chien-Ming Chang, and newcomer Mickaël Frappat, to see what we could learn about this feverishly anticipated new work. 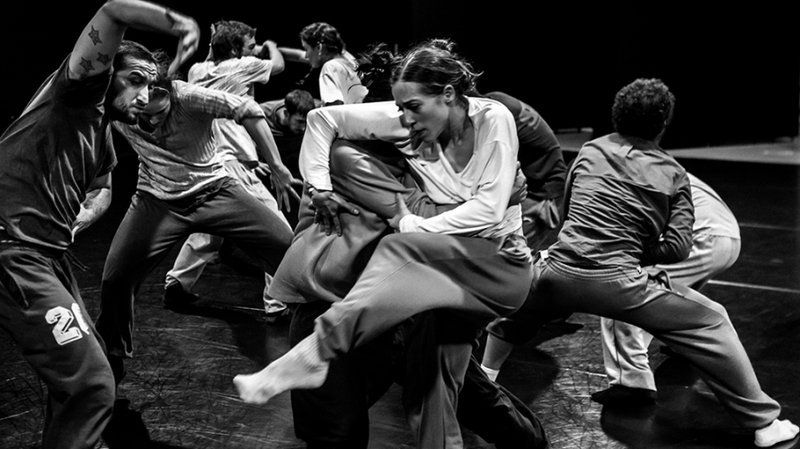 Mickaël, tell us how your first few months with Hofesh Shechter Company have been. MICKAËL: These first months in the company have been, simply, a real pleasure. Humility and humanity are two words that I particularly remember coming up a lot. Usually I am very serious, even too serious sometimes because I like responsibility, my work has rarely left me the opportunity to ‘let go’, but since working with Hofesh, I am a little more open to… fun. Tell us about the piece. MEREL: Well, at this very moment there is not really a piece yet. We have loads of phrases, images and live music, but we still have a long way to go. I’m excited to see how it all fits together. And what sort of images have come up in rehearsal? CHIEN-MING: There is some imagery and energy that [Hofesh] knows he wants. But he has also left some of it very open for us to play. And we played a lot. Is fear central to Grand Finale? CHIEN-MING: Fear, being afraid to fight and win. Hofesh said he doesn’t want to revisit darkness in this piece so the process has felt quite playful, the energy was light and ‘up’. BRUNO: It will not be a happy piece; sometimes quite funny, but not happy! There will be a sense of going over a cliff, smiling. Something of past glory then things falling apart. It will be large scale, a very beautiful landscape, I think. Beautiful music. Quite dark in parts. My hope for this piece is that it will be as apocalyptic as possible. Do you have any other hopes for the piece, as it nears production time in Plymouth? CHIEN-MING: I hope this piece will make the audience think about life, about how we live it. I hope it will be exciting to watch but also make the audience think a little. You’ve toured to Plymouth four times before. What’s your favourite spot in the city? KIM: Next to the Lighthouse overlooking the bay. Who should come and see the work?